Endosseous root form dental implants have been available since the 1960s while dental Small-Diameter Implants were first introduced commercially in the dental field in 1990. The aim of this study was to determine, the survival of narrow diameter implants, whether survival is dependent on whether these implants are placed using a flap or flapless approach, and whether there is a relationship between length and implant survival in SDIs. Forty one studies (10,093 implants,2762 patients).were included using SDIs from a variety of companies and surface characteristics with diameters of 1.8 mm to 3.5 mm and lengths of 8 mm to 18 mm. 26 studies use flap reflection techniques, 6 used a flapless technique, 2 studies used both techniques; technique was not specified in the remaining studies. Follow up duration varied from 5 months to over 9 years. Failure was reported most often in short SDIs (less than or equal 13 mm) (n = 88) compared to longer ones (more than 13 mm). Sohrabi K, Mushantat A, Esfandiari S, Feine J. How successful are small-diameter implants? A literature review. Clin Oral Implants Res. 2012 May;23(5):515-25. doi: 10.1111/j.1600-0501.2011.02410.x. Epub 2012 Feb 7. PubMed PMID: 22313216. Only 3 randomised controlled trials were included in this review and the qualitative summary includes studies of different design and no quality assessment. Consequently there may be issues of selection bias in both the prospective and retrospective designs that need to be taken into consideration when assessing the overall outcomes. Also as patients have received multiple implants they may be an impact from clustering which is not often considered within the statistical analysis of these type of studies. There is a Cochrane review that relates to this topic area by Esposito et al laste updated in 2007. Based on the available results of RCTs, there is limited evidence showing that implants with relatively smooth (turned) surfaces are less prone to lose bone due to chronic infection (perimplantitis) than implants with rougher surfaces. On the other hand, there is no evidence showing that any particular type of dental implant has superior long-term success. These findings are based on a few RCTs, often at high risk of bias, with few participants and relatively short follow-up periods. More RCTs should be conducted, with follow up of at least 5 years including a sufficient number of patients to detect a true difference. Such trials should be reported according to the CONSORT recommendations (www.consort-statement.org/). Esposito M, Murray-Curtis L, Grusovin MG, Coulthard P, Worthington HV. 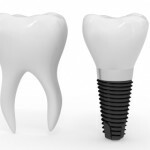 Interventions for replacing missing teeth: different types of dental implants. Cochrane Database of Systematic Reviews 2007, Issue 4. Art. No. : CD003815. DOI: 10.1002/14651858.CD003815.pub3.